Some days are just full of great information. DGS had a new App to review and I got to play with it for a few minutes. Look at the results of a quick picture on his iPad, a quick edit in the Brushstroke App and an email to my laptop. I NEED this App. When he comes back on Monday with his iPad I am going to be playing around with this one again (App for iPad and iPhone). Now you have to know - I have been on a painting roll. 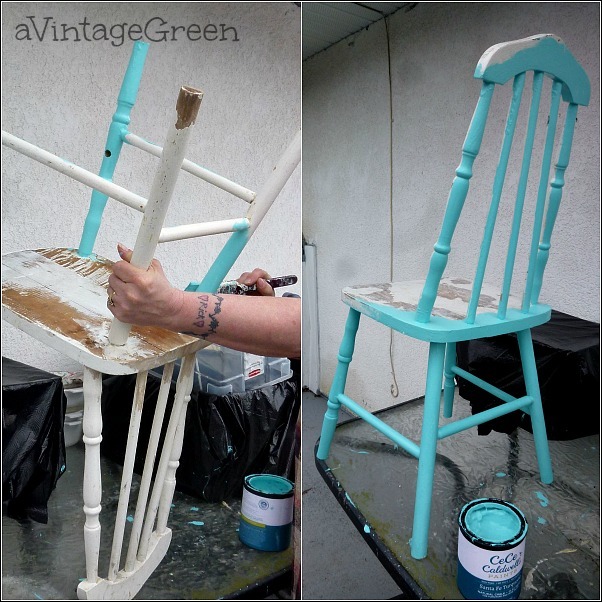 It was SUNNY on Monday last week and my dear friend Judy and I painted a chair, a stool, a picture frame (and 3 more pieces and 5 shutters which will be in Thursday's post) between 12:30 and 3:00. Whew. We rocked. 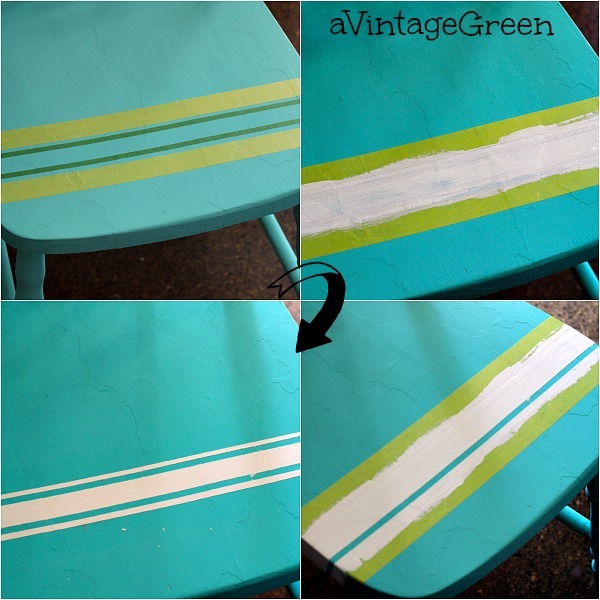 Paint colour was turquoise (CeCe Caldwell Santa Fe Turquoise Chalk-Clay) with some white (ASCP Simply White) for stripes. Wax was ASCP Soft Wax. This was the first good painting time on the deck outside in MONTHS. A bit of touch up painting was needed but I did that inside during the week (it rained every day). Grain sack faux stripes were added to the stool (reverse, natural finish was taped before painting). Stool was waxed (Annie Sloan Soft Wax) and polished, seat was waxed 3 times for a harder finish. Here is the before and after. 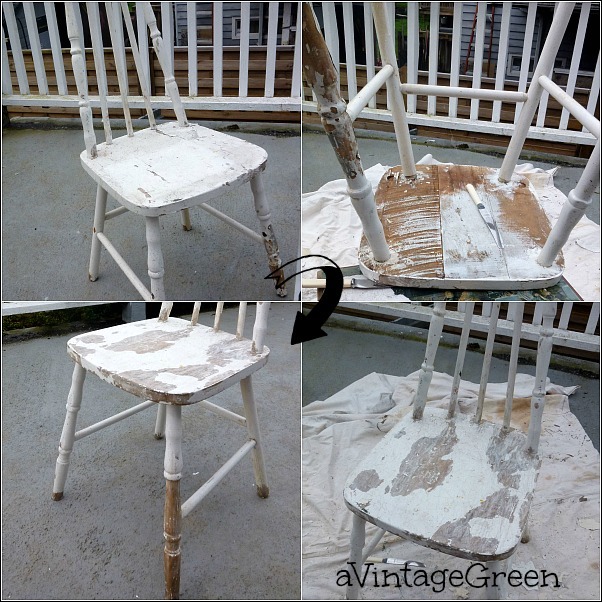 The vintage chair (below) that was painted needed quite a bit of scraping to remove the loose paint. This old chair seems to be made from reclaimed parts (front legs have holes for a rung outsides and one inside but it is sturdy enough). 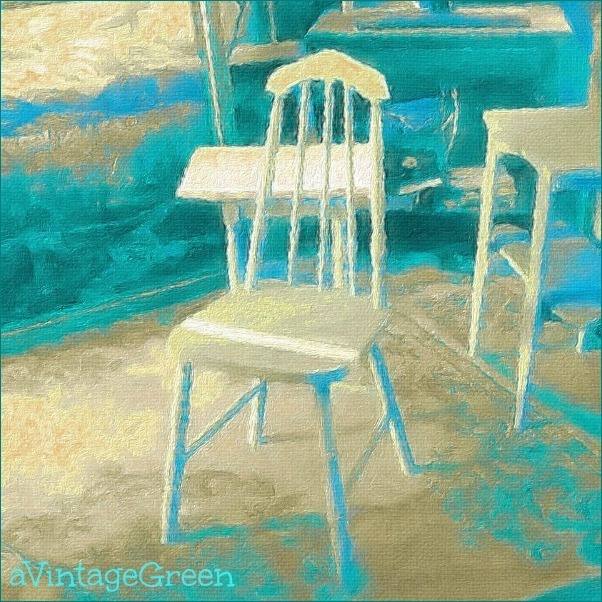 The vintage old chair before it was painted makes a wonderful collage for Judith's Mosaic Monday. To make the painting seem faster the legs were painted first. 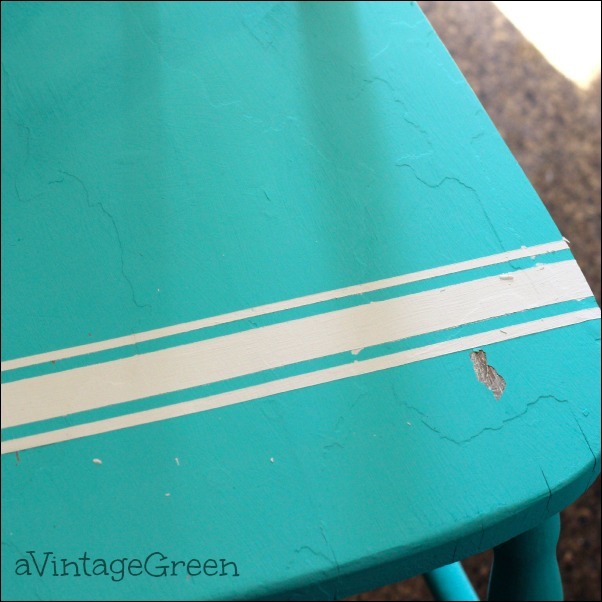 When the paint dried I used masking tape for the faux grain sack stripes. Painted over the tape and pulled off first piece of tape, then the rest of the tape. Some careful touch ups were needed. Tape pulled off a piece of paint and I did a bit of careful touch up painting. 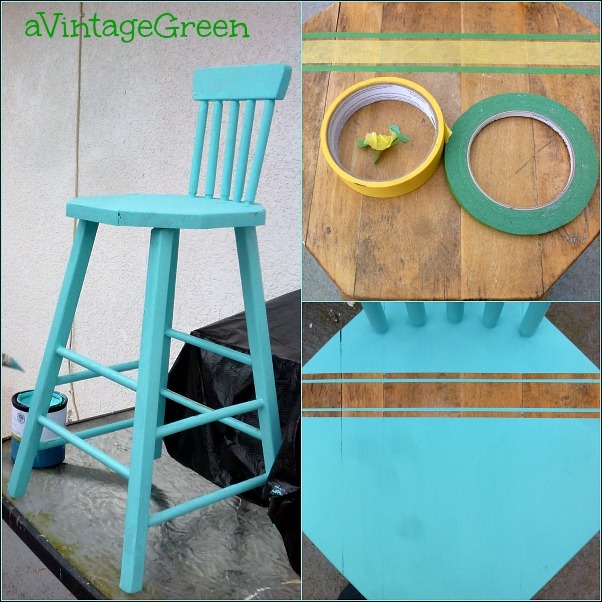 The group of furniture painted turquoise blue is just right for joining in with Sally for Blue Monday. 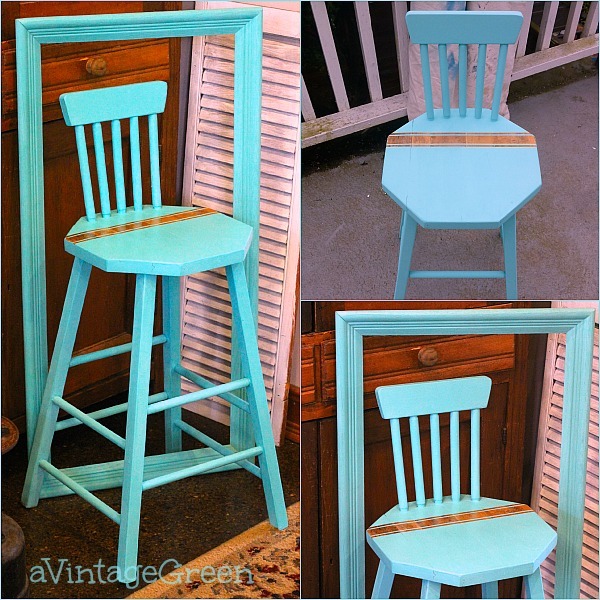 I think Brenda of Cozy Little House will like the turquoise, it fits right in with her wonderful new colours in her home. 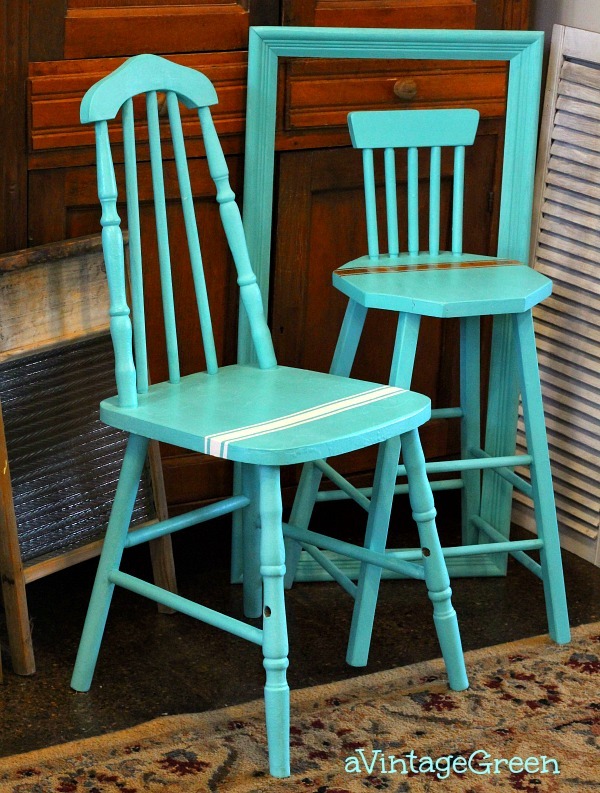 And Claudia of Mockingbird Hill Cottage would appreciate the turquoise too, it is definitely her colour as well and I know that Judy of 20 North Ora will appreciate seeing what I've been up to this week. Hello friends. I always enjoy seeing what you have been up to. You do such beautiful work on everything you do. Hope you have a very happy Easter. Today John has been gone for five months - such a long time. But, I know he is loving spending his first Easter with our Lord. I love the little back on that stool! Cute! What a nice job you've done! I've only just tried ASCP and I love it! I love green, it is my favourite colour. I love all your photos and the painting is gorgeous! Great transformations! I wish you were closer I have just given away a beautiful pine desk as no-one wants pine these days I was told! They would after you'd finished with it with a touch of turquoise paint and some stripes, it would have looked great! What an amazing transformation. Things old can be new again. Enjoyed seeing the process of your work. What precision! That stripe is the perfect touch. Thanks for sharing. I LOVE your blues! Paint really does work magic, doesn't it? Lovely job! Thanks for sharing. Visiting from Sally's Blue Monday and Judith's Mosaic Monday. 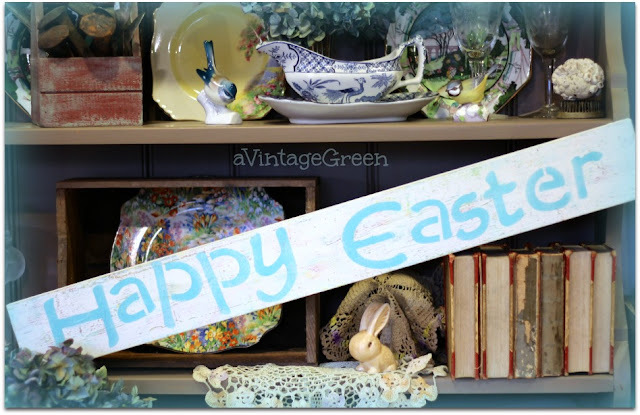 Hope you had a lovely Easter and enjoy your day. Really like the color you chose. The strip makes a great touch to them. Love love love the color! Well, I like them too, and the colors are really pretty. The french grain sack stripes really make the chairs pop. I also wish you lived closer, really like the look. 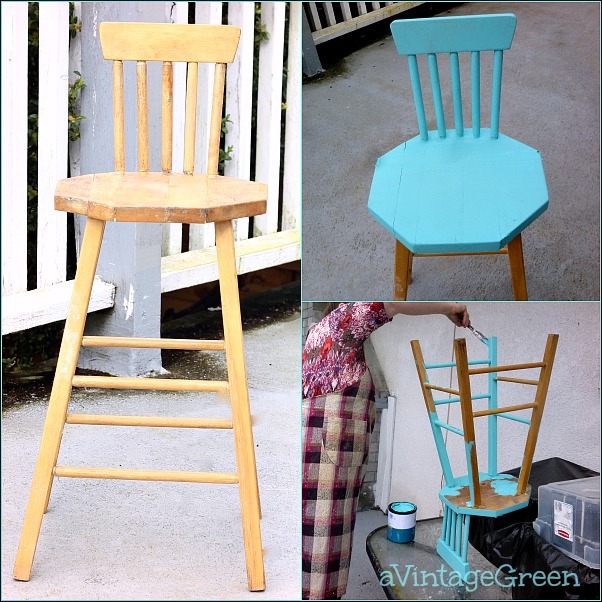 An admirable transformation of a chippy old chair to a pretty aqua one. Adding the grain sack stripes livens the pieces up. Thank you for linking to Mosaic Monday Joy. I admire people who can paint...I will be trying to paint some outdoor furniture this year...I usually get more on me than the surface I am painting. Oh Joy, your chairs are absolutely fabulous!! I just love how you transformed them :) Thank you, my dear, for sharing with Roses of Inspiration. Enjoy your day! Bright and cheery! Love the grain sack stripe idea. I think I have a couple of pieces to paint this spring...I just might try that. Thank you for joining my "Let's Talk Vintage!" link party! So beautiful and cheerful! I love the color you have shared. 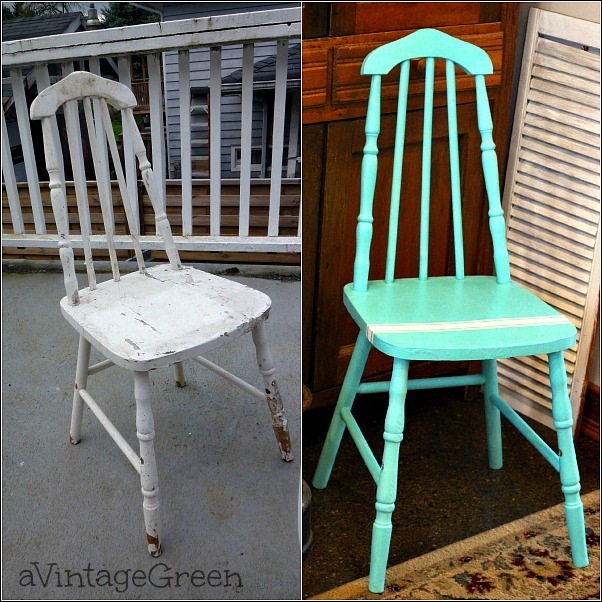 You did a beautiful job redo the chair. Thanks for sharing. Enjoy your weekend. Love, love, love...turquoise fan here too. Visiting via Share Your Cup. Oooh I love the color you picked. Those chairs turned out lovely. Awesome paint job! Love the color! The stools are so uniquely shaped, too! 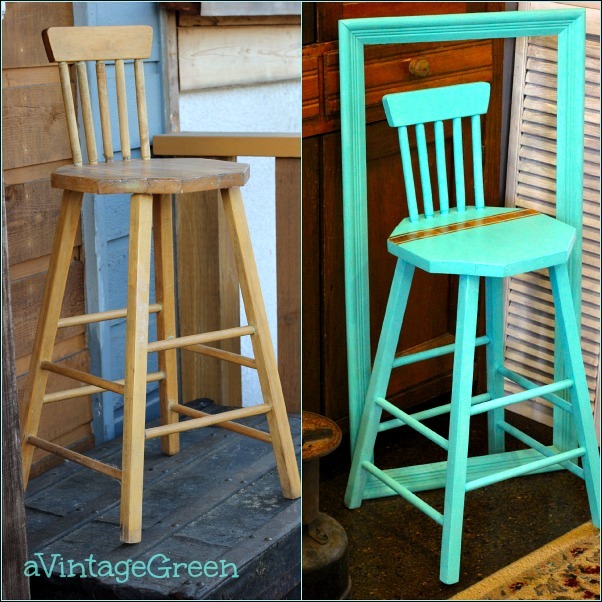 Oh my, I just love that adorable stool! Very nice makeover. Where did you find the narrow painter's tape? I've looked everywhere for it.